The strong point of this organic cosmetic, the Shower Lotion Super-oily with Nourishing Shea Oil 1 litre Douce Nature, lies in its formulation which contains plant-based active ingredients such as shea oil and aloe vera extract. These ingredients provide hydration and protection, which will help your skin by providing intense hydration and softness. This Super-oily Shower Lotion is recommended for delicate, sensitive and ultra-dry skin. Aqua (Water), Glycerin, Cocamidopropyl Betaine, Sorbitan Caprylate, Helianthus Annuus (Sunflower) Seed Oil*, Sodium Chloride, Benzyl Alcohol, Sodium Cocoyl Glutamate, Xanthan Gum, Chondrus Crispus (Carrageenan), Lactic Acid, Coco-Glucoside, Glyceryl Oleate, Sodium Benzoate, Butyrospermum Parkii (Shea) Oil, CI 77891 (Titanium Dioxide), Parfum (Fragrance), Aloe Barbadensis Leaf Juice Powder*, Citric Acid, Linalool, Sodium Hydroxide, Hydrogenated Palm Glycerides Citrate, Tocopherol. 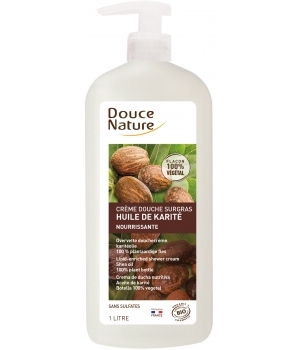 Shower Lotion Super-oily with Nourishing Shea Oil 1 litre - Douce Nature referenced by Monde bio.